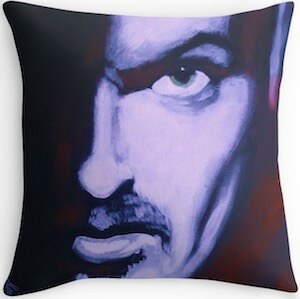 This George Micheal throw pillow is a great pillow to have and one that keeps the memory of this amazing artist alive. The pillow shows a portrait of George Micheal and it has a purple huge and black part and that makes it really easy to combine it in almost any interior. A pillow like this looks great on the couch or a chair and could even be used on a bed. You can get this George Micheal pillow in 3 sizes and it is also available as just a pillow case. Let’s not forget George Micheal so add this pillow to your home.